Pulp Fiction was right. The funniest thing about other cultures is the little differences. The radically different customs and traditions in other cultures make sense to us, but our similarities? Now those are weird. Take for example convenience stores. They’re pretty much ubiquitous in both Japan and the United States, but some little differences set them apart. And a lot of the time, those little disparities make a world of difference. If you’re unfamiliar with American convenience stores, you’re not really missing out on a whole lot. Generally, they’re attached to gas stations, and are seen as kind of scuzzy places. American convenience stores don’t offer a lot of high-end products, but if you’re looking to buy cigarettes, gum, or three-day-old hot dogs, then they are the place to go. And convenience store bathrooms? They’re cesspools of disease and filth where superviruses are born. Convenience store bathrooms are places where you might be tricked into thinking syringes are standard issue. In short, American convenience stores are places I only visit when I need to pay for gas (or have a Slurpee craving). Now Japanese convenience stores, on the other hand, couldn’t be more different. 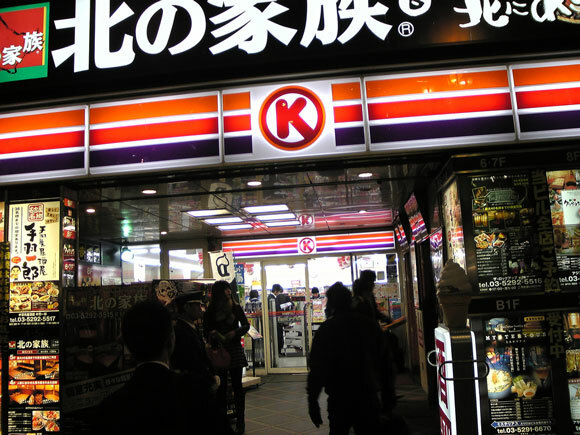 There are a few things that Japanese convenience stores (or konbinis) have in common with American convenience stores. ampm recently got bought up by a Japanese convenience store and Circle K combined with a Japanese chain called Sunkus. Lawson is now virtually unheard-of in the USA, and the Japanese 7/11 franchise actually got so big that it bought out its parent company. And that’s not even mentioning all of the homegrown Japanese konbini chains like Family Mart, Ministop, and a bunch of other, smaller chains. But what sets the konbini part from your average, everyday American convenience store? For one, they do everything. — Not only is there the typical convenience store fare of food, magazines, manga, and other assorted goods, but they sell concert and amusement park tickets. You can pay your bills, withdraw money from an ATM, and use the copier. Some sell clothes and other wares. Konbini chain Family Mart has even considered getting into the funeral business. If that’s not one-stop shopping, I don’t know what is. Konbini food, believe it or not, is actually pretty decent. Unlike the microwave chimichangas you’ll find in American convenience stores, konbini food appears edible and sometimes even fresh. Not only are there convenience store staples like candy, chips, and soft drinks, but the hot food at a konbini is what makes them shine. 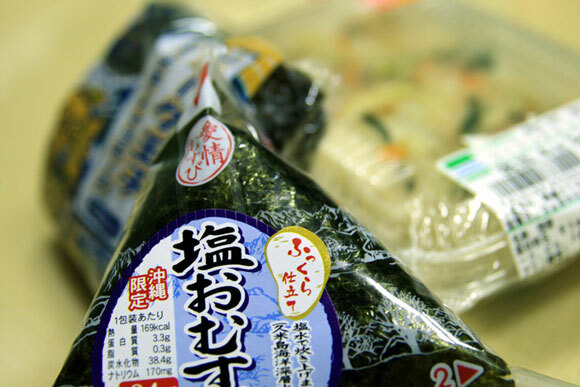 From the cherished onigiri riceballs to bento meals, pre-prepared konbini food isn’t half-bad. Some onigiri are even wrapped in such a way that the seaweed isn’t touching the rice, preserving its freshness and crispiness. Even the TV-dinner style (not frozen) bento are pretty great (for the price, at least). If you want, you can get your meal warmed up for you in a ridiculously strong microwave. What should take a minute or two takes a fraction of that. I wish I had a microwave like that at home. Drinks in a konbini aren’t limited to Slurpess and drip coffee, either. They offer hot drinks that are closer to a cafe a than old coffee grounds that are usually offered at American convenience stores. Of course, there’s also all the staples like tea, fruit drinks, and all the standard Coke and Pepsi fare. One notable difference between American and Japanese convenient stores is the safety-factor. I read somewhere a while back that 24 hours konbini actually became a sort of safe-haven for women in Japan. If they thought someone was following them, they could go inside one of the brightly lit stores and wait a while before continuing on. Besides that, though, they just have an overall feeling of “safe” to them. When I go into an American convenience store, I get out as quickly as possible, assuming that at any moment a gun wielding lunatic will be coming in demanding all the money (and then I’d have to use my super powers to save the day, and that’s just inconvenient if you ask me). Of course, Japan is a generally safe country already, but while we’re comparing I feel like it ought to be brought up. Konbinis also tend to be a great place to loiter. I don’t know about you, but in America you don’t see people standing around for hours reading magazines. Konbini in Japan are a great place to do this. Even if a store clerk minded, they’d be too polite to tell you to leave (they don’t mind, though, everyone does this). If you’re the loitering type, konbini are a great place to do it at. American convenience stores? Prepare to be yelled at by a grumpy employee. Oh, And They’re For Everybody! I think American convenience stores have pretty specific markets. When I envision a US 7/11, I see sketchy middle aged dudes and groups of no-good teenagers (damn kids!) hanging around inside the store. Konbini, on the other hand, attract a pretty broad audience. They’re seen more as small corner stores for anybody to use. Not to mention, they’re pretty convenient, even when you’re not looking to get cigarettes and booze. I would also recommend a write up about konbini from one of my favorite Japan blogs, This Japanese Life. You can check it out here. Which is your favorite konbini store? What do you like to get there? Tell me us on twitter!